SUNLIGHT RECYCLING was awarded with the highest distinction in the Circular Economy & Symbiosis Network and Battery Recycling Business categories, at this year’s Waste & Recycling Awards that held on Wednesday, December 13th. Through SUNLIGHT RECYCLING, SUNLIGHT’s production process is vertically integrated, enhancing its capacity and competitiveness. It contributes significantly to the reduction of imported lead and covers more than 58% of SUNLIGHT’s total lead needs for the production of new batteries. 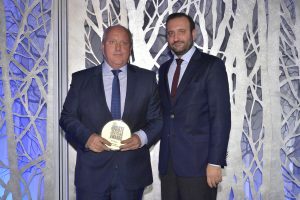 The awards were received for SUNLIGHT RECYCLING by Mr. Spyros Coppolas CEO and Vassilis Stamelakis Operations Manager.